Talk about a quick read! This was a book I ordered through inter-library loan when I started thinking about writing Tarzan fan fiction set in South America. I had no idea it was less than 50 pages long and filled with pictures. Say what you will about kid's books, they're a good way to get a quick overview of an area. 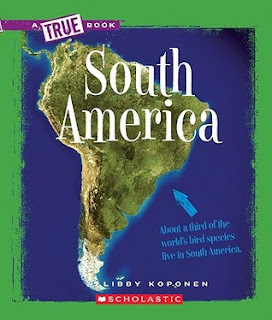 This one helped me get a general feeling for the South American continent and helped me pinpoint areas I would like to explore in more detail. I am ashamed to admit that I know less about our neighboring continent to the south than I do any other continent on the planet. It's like I have this huge blind spot just south of Mexico. For instance, I had never heard of the Atacama Desert, the world's driest desert. It gets less than half an inch of rain a year! That makes the Mojave look like a rain forest in comparison. Speaking of rain forests, that was one thing I knew was in South America, but I guess I forgot that's not all that's down there. Along with plains and waterfalls and so on, there is also a place called Patagonia. I had heard the name, but had no idea where it was. It's like Antarctica crept onto the South American continent and took up residence. For such a small book, I learned a lot and now I know more about what I don't know and I'm motivated to learn more. See, sometimes it's worth reading a kid's book on a subject. At least it doesn't drag on and on and on.